VIENNA, VA (BRAIN)—Bikes for the World is losing its long-time storage site in Northern Virginia to redevelopment and is soliciting leads for a new location in the region. EUGENE, OR—Rolf Prima has signed DaDa Sports as its distributor for the Philippines. FRIEDRICHSHAFEN, Germany (BRAIN)—Eurobike will be launching a new public exhibition called VELOBerlin on March 26 and March 27. VELOBerlin is a co-production of Eurobike and Berlin’s cycling center of excellence, Velokonzept. SAN JUAN CAPISTRANO, CA (BRAIN)—Interbike will have new floor layout for the 2011 edition of its International Bicycle Expo (September 14-16). EAGLE, CO (BRAIN)—A hit-and-run driver who plowed into a cyclist in Vail will only be charged with a misdemeanor after a judge on Thursday accepted a controversial plea deal, according to a Colorado news report. SAN FRANCISCO, CA (BRAIN)—B-cycle will demonstrate its bike share system in San Francisco this Saturday and Sunday at Civic Center Plaza (in front of San Francisco City Hall) from 10 a.m. to 3 p.m.
INDIANAPOLIS, IN (BRAIN)—The North American Handmade Bicycle Show is preparing for a record-breaking year, with exhibitor figures looking to surpass the mark of 150 set in Portland, Oregon, in 2008. BOSTON, MA (BRAIN)—Helmtops has new partnerships with three bicycle distributors increasing the availability of their new product. CORTEZ, CO (BRAIN)—Osprey Packs has added Katie Koppenhafer and Chris Horton to the Osprey customer service team. TAICHUNG, Taiwan (BRAIN)—Cycling Sports Group has signed a distribution deal with Ti Cycles to sell its GT and Mongoose brands in India, the company’s latest move to penetrate emerging markets in the Asia Pacific region. BERKELEY, CA (BRAIN)—The National Interscholastic Cycling Association is planning an annual awards banquet to honor individuals that have made outstanding contributions and achievements in the development of high school cycling. 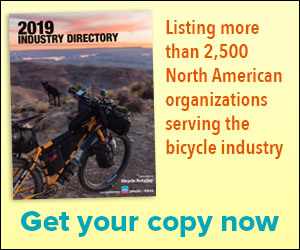 CHATTANOOGA, TN (BRAIN)—Preseason orders for American Bicycle Group (ABG) brands Litespeed and Quintana Roo (QR) have increased a combined 21 percent over preseason orders in 2010.